Between the base C300, the warmed-over C450 AMG, the full-speed-ahead AMG C63, and the C63 S, there are a lot of choices for go-fast C-Classes. 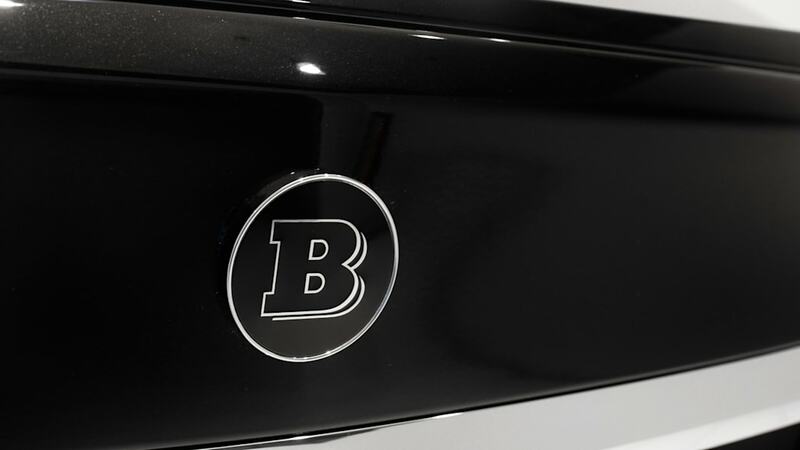 Whether it helps with the decision or just makes it more complicated, Brabus is here with another option. The venerable Benz tuner is now offering an aftermarket package that further closes the gap between the C450 (soon to be renamed as the Mercedes-AMG C43) and the more powerful C63. By squeezing an extra 43 horsepower out with its PowerExtra B30-410 kit, the C450's output jumps from 362 hp to 405 – bridging the divide to the 469-hp C63. The 0-62 sprint drops as result from 4.9 seconds to 4.6, while the top speed jumps from an electronically limited 155 miles per hour to a free-running, Autobahn-crunching 174 mph. To go with the engine enhancements, Brabus is also offering a full aero kit, exhaust system, rolling stock, and interior upgrades. Of course it's all up to the customer to spec his or hers out to order. But whatever options are selected, they're all covered by a full three-year warranty so you can put your mind at ease while burying the accelerator into the Brabus-emblazoned floor mat. 302 kW / 410 HP, 570 Nm and 280 km/h for the most powerful all-wheel-drive variant of the current Mercedes C-Class: The BRABUS PowerXtra B30-410 performance upgrade makes the C 450 4MATIC Sedan or Wagon even sportier. 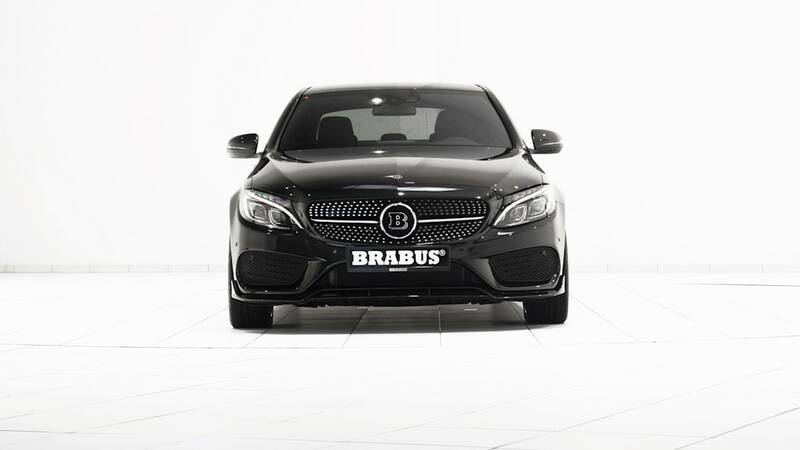 In addition, BRABUS (Brabus-Allee, D-46240 Bottrop, phone + 49 / (0) 2041 / 777-0, fax + 49 / (0) 2041 / 777 111, Internet www.brabus.com) also offers a sport exhaust system with actively controlled butterfly valves, tailor-made BRABUS Monoblock S 19-inch wheels and exclusive interior options for this model. 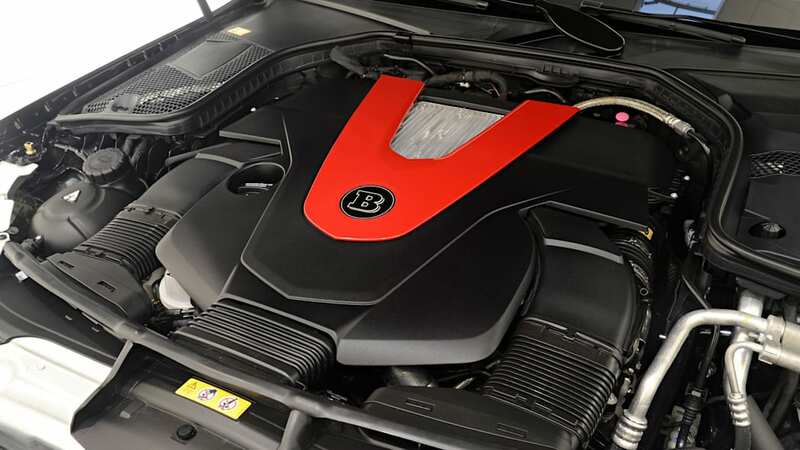 BRABUS further expands the world's most extensive range of engine tuning for Mercedes-Benz automobiles with the new BRABUS PowerXtra B30-410 performance upgrade for the Mercedes C 450 4MATIC. 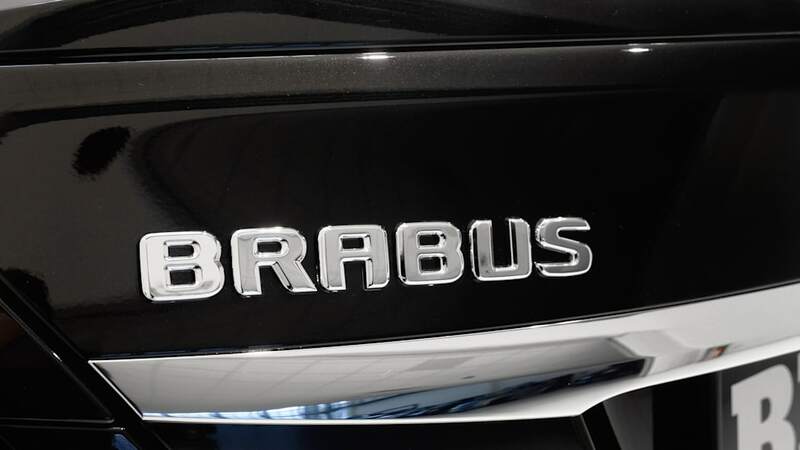 To this end, BRABUS integrates the new plug-and-play tuning module into the engine electronics of the three-liter twin-turbo V6 gasoline engine. The auxiliary control unit provides the engine with newly calibrated mapping for injection and ignition while moderately increasing the boost pressure. After the installation, the engine pumps out an extra 32 kW / 43 HP (43 bhp) of power and puts an equally effective 50 Nm (37 lb-ft) of additional torque on tap. 302 kW / 410 HP (405 bhp) at 6,100 rpm and a peak torque of 570 Nm (420 lb-ft) at a low 3,700 rpm make the all-wheel-drive C-Class even more dynamic. 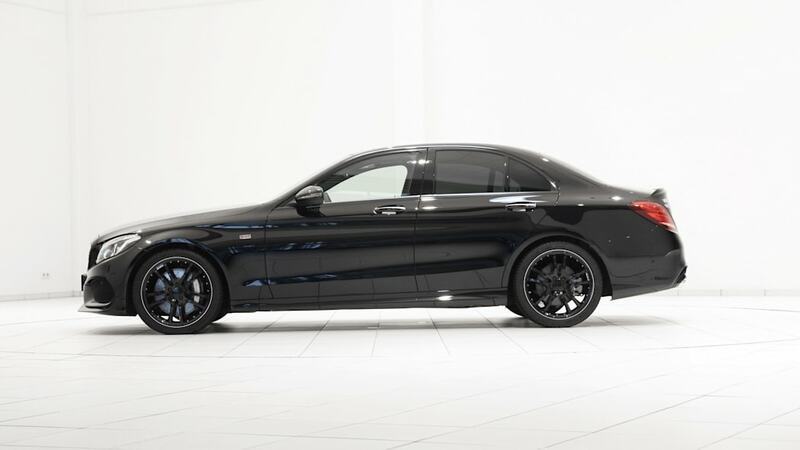 The sedan equipped with BRABUS PowerXtra B30-410 upgrade accelerates from zero to 100 km/h (62 mph) in just 4.6 seconds. In conjunction with the elimination of the electronic speed limit included in the performance upgrade, the top speed increases from 250 auf 280 km/h (155 to 174 mph). Even more significant than the improved performance is the even more superior sensation at the wheel in everyday driving resulting from the perfect interplay between the tuned six-cylinder and the seven-speed automatic transmission. The added power across the entire engine rev range is not only reflected in even more agile driving dynamics, but when employing a comparable driving style also in further reduced fuel consumption thanks to the further optimized in-gear acceleration. 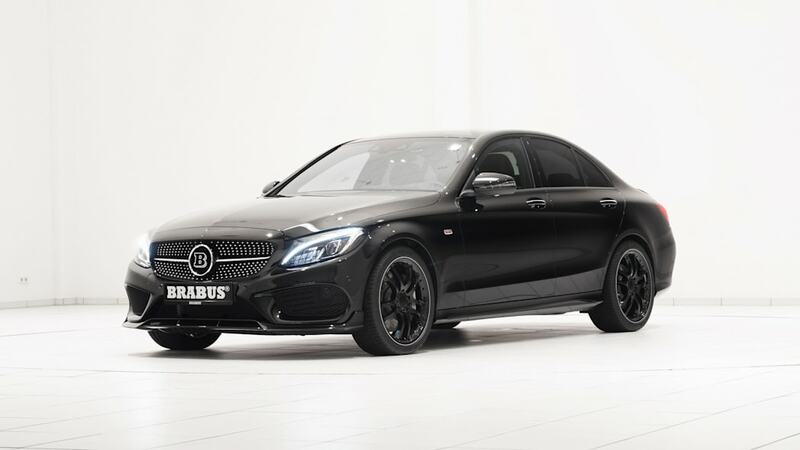 The performance kit for the C 450 4MATIC is of course backed by the exemplary BRABUS Tuning Warranty of three years, up to 100,000 kilometers / 62,000 miles (see BRABUS Warranty Terms and Conditions, updated July 2013). Technology partner MOTUL supplies the perfect high-performance lubricants for the entire powertrain. 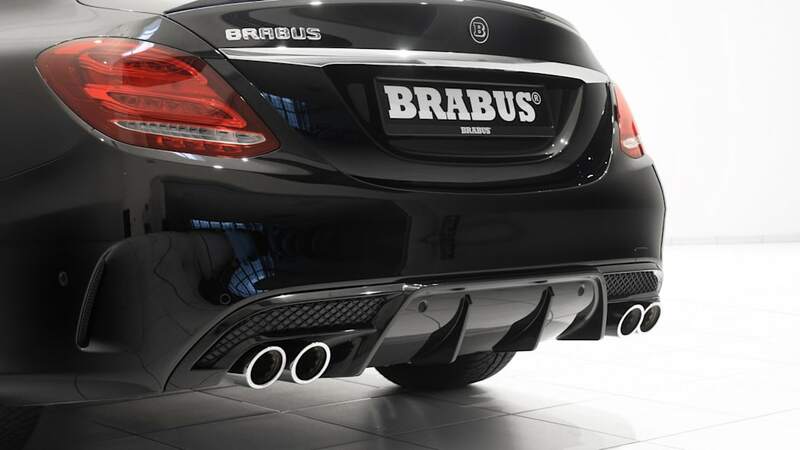 For further enhanced driving fun and more striking looks at the rear, BRABUS recommends the installation of the BRABUS quad sport exhaust aft of the production catalysts. The exhaust has four tailpipes and features an electronically controlled system of butterfly valves activated from the cockpit. In the "Coming Home" default setting, the C 450 is even more subdued than with the stock exhaust. In contrast, with the butterfly valves open, the six-cylinder twin-turbo sounds markedly sporty and powerful. Of course, BRABUS offers not only powerful and highly resilient engine tuning for the Mercedes 4x4. The BRABUS designers developed tailor-made aerodynamic-enhancement components manufactured from high-grade PUR in OEM quality to give the car an even sportier appearance. 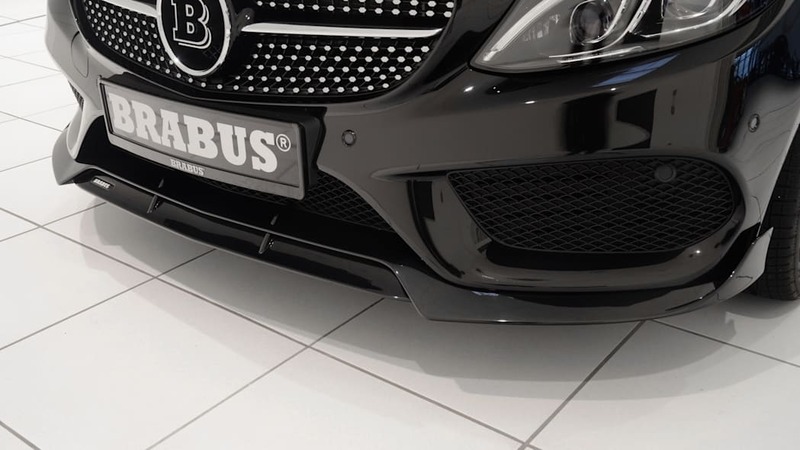 The BRABUS front spoiler attaches to the production bumper. Its central spoiler blade and the outer sections shaped like flaps from motor racing lend the vehicle an even more distinctive front. In addition, the component also reduces lift on the front axle, which further optimizes handling stability at high rates of speed. 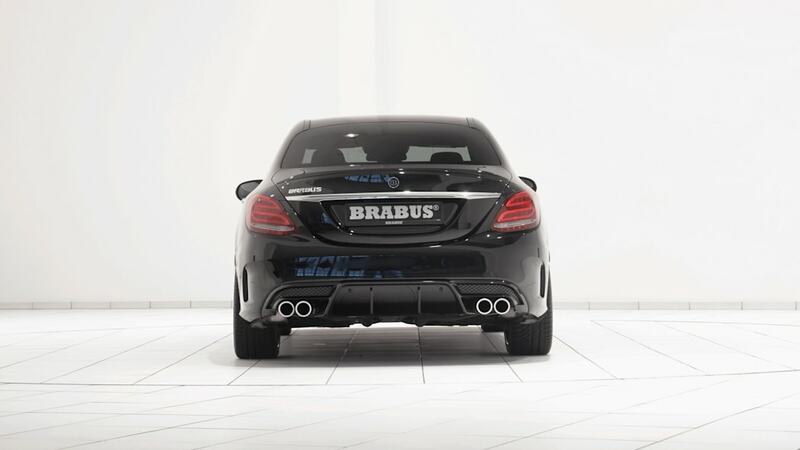 The rear end is refined with the BRABUS rear diffuser, which provides the perfect backdrop for the four chrome-plated tailpipes of the BRABUS stainless-steel sport exhaust. 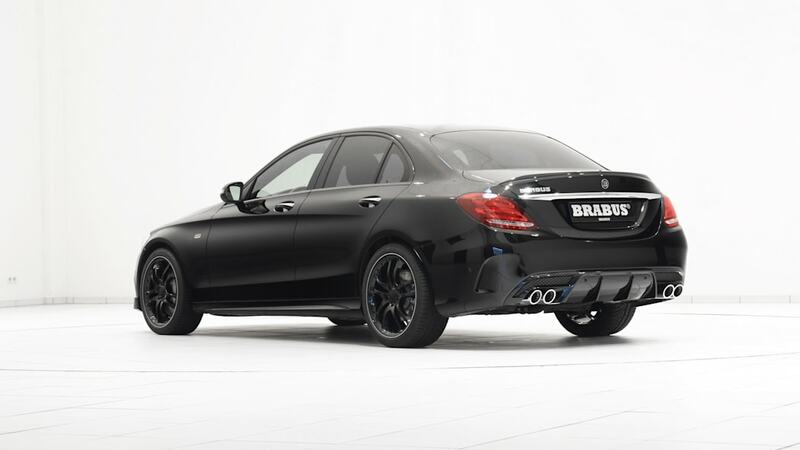 The C 450 Sedan can be upgraded additionally with the BRABUS rear spoiler, which also comes in a variant made from naked carbon. The BRABUS Monoblock S wheels, developed especially for the 4MATIC variant with a diameter of 19 inches, also play a crucial role in the thrilling BRABUS look. The alloy wheels feature five double spokes extending all the way to the outer flange. They are mounted in size 7.5Jx19 at the front and in size 8.5Jx19 on the rear axle. 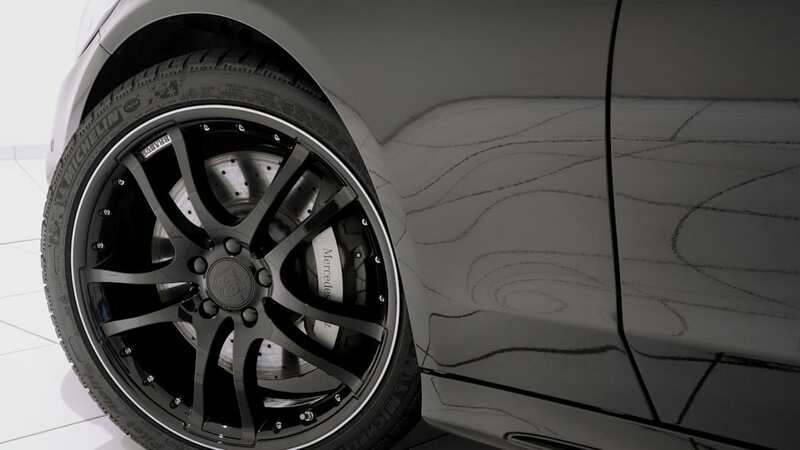 BRABUS selected tires of sizes 225/40 ZR 19 and 255/35 ZR 19 as optimal. The interior of the C 450 4MATIC can also be customized to owner preferences in every detail. 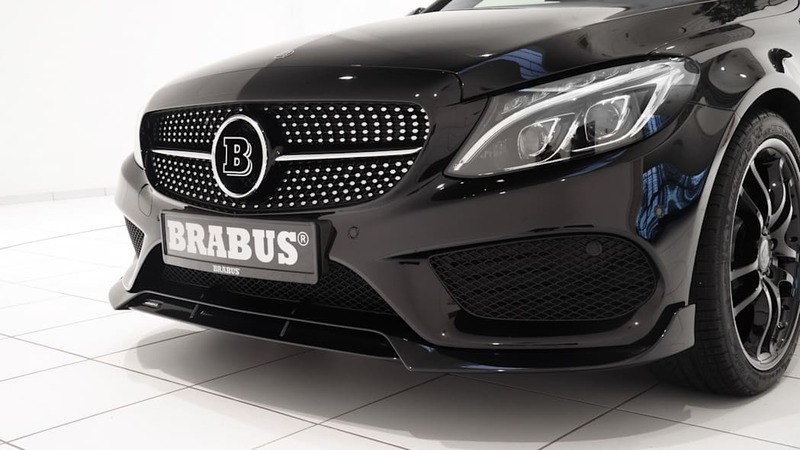 The product range offers a host of custom accessories such as aluminum pedals, high-quality floor mats or scuff plates with backlit BRABUS logo. 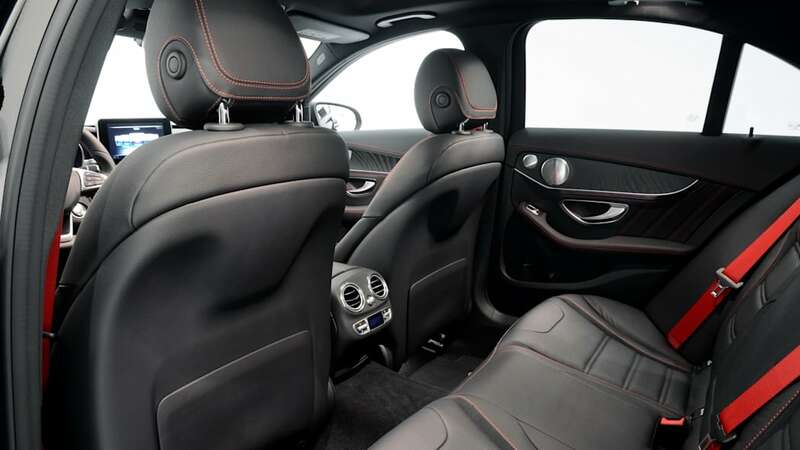 The exclusive BRABUS fine leather interior appointments are made from especially soft and breathable leather and Alcantara. 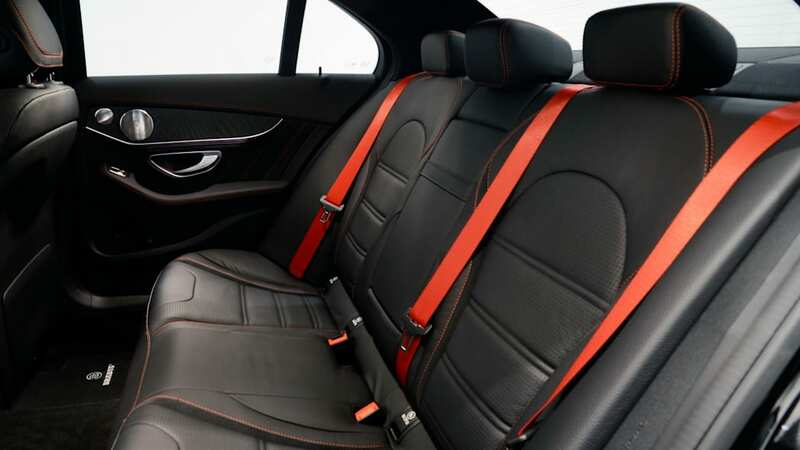 Like the especially classy BRABUS wood trim sets or the markedly sporty BRABUS carbon trim sets, they can be manufactured in a virtually endless variety of colors.